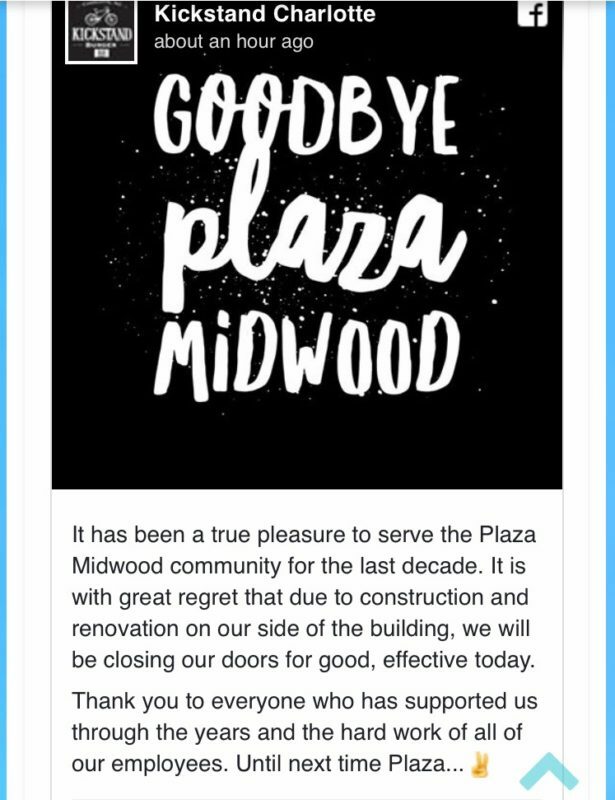 Bummed to hear this news. If you’re in town for a Carolina Panthers, Charlotte Knights, or Charlotte Hornets game, but don’t want to eat in Uptown, head a couple miles over to Central Avenue. In the heart of the trendy, but still cool Plaza-Midwood neighborhood, you’ll find a variety of restaurants. One restaurant that I recommend is Kickstand Burger Bar. It shares a parking lot and waiting area with La Unica, so parking can be a little tight depending on the time you go. It’s worth it. The bar is in the middle of the restaurant, surrounded by booths. Just past the bar, you’ll find a few more booths along with tables in the middle. There are TVs lining the walls. The booths at the front of the restaurant have personal mini TVs. There’s also a large jukebox by the kitchen doors. Much like the rest of Plaza-Midwood, the restaurant has a very laid back vibe. The staff is friendly and attentive. 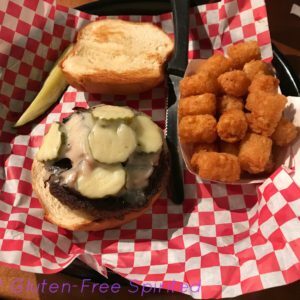 Kickstand Burger Bar is just minutes from Uptown and is a great spot for a pre- or post-game meal. 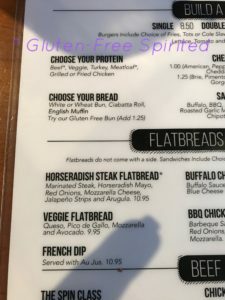 Gluten-free options can be found on the menu. Menu items sans soy are harder to come by. My dad took Nikki & I to Kickstand for Nikki’s birthday dinner. After discussing menu items with the waitress, Nikki selected a grilled chicken sandwich with salad. Shortly after placing the order, the manager came to our table & informed us that the waitress was mistaken about the chicken being soy-free. The chicken was marinated in oil that contained soy. The chicken is marinated in the soy in the mornings, so unfortunately they didn’t have any chicken not marinated with soy. The manager offered Nikki a vegan or turkey burger. Nikki chose a regular burger with lettuce & a gluten-free bun. Though my dad suggested just using water as dressing, Nikki opted for balsamic dressing on her side salad. Nikki approves of their gluten-free buns. Despite it’s name, Kickstand doesn’t just serve burgers and they have gluten-free items. If you’re not into beef, Kickstand’s got you. You know the drill. Scroll past this section if you don’t want to see #foodporn you can’t have. This is your last warn- you’re looking aren’t you? Don’t say I didn’t warn you. 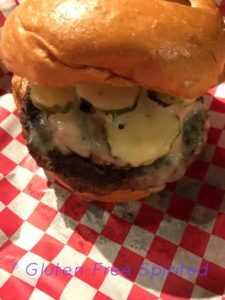 I built my own burger (bacon cheeseburger with pickles; it came with a dill pickle. One can never have too many pickles.) and had tater tots. Always get the tots. Kickstands Burgers are a mouthful! My dad tried their Beer Can Burger special. It changes weekly. This burger had chicken, cheese, and bacon. It was lit. He also had the tots. Further proof that Kickstand builds burgers right! The food tastes even better than the pictures look! 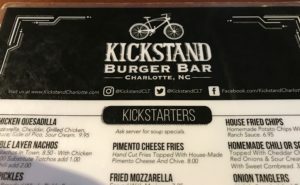 Make sure to stop by Kickstand whenever you’re in Charlotte! 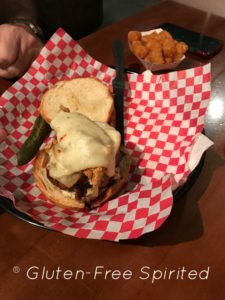 If you like this, you might be interested in what to order at: Smashburger , Texas Roadhouse, Golden Corral, and Cracker Barrel. Get social with me and follow me on social media. Don’t forget to share this with others who might be visiting Charlotte! Yum!! My choice would totally be what your dad had – the beer can burger. 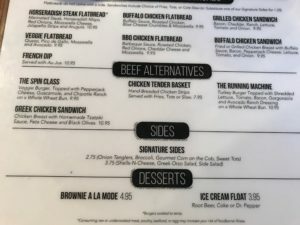 It’s good to learn about good restaurants and have recommendations on what to order because when the hunger kicks my head just goes blind and I end up going to the same place every time. He let me try his burger & it was good! It is very easy to get stuck in a routine and go to places close by or where you already know what to order. It happens to us all the time. The burger indeed does look delicious! I could eat it straight away. The first burger however does look very sad… I hope it tasted much better than it looks. My burger was very good! LOL my sister’s did look a little sad, but she said it was really good. 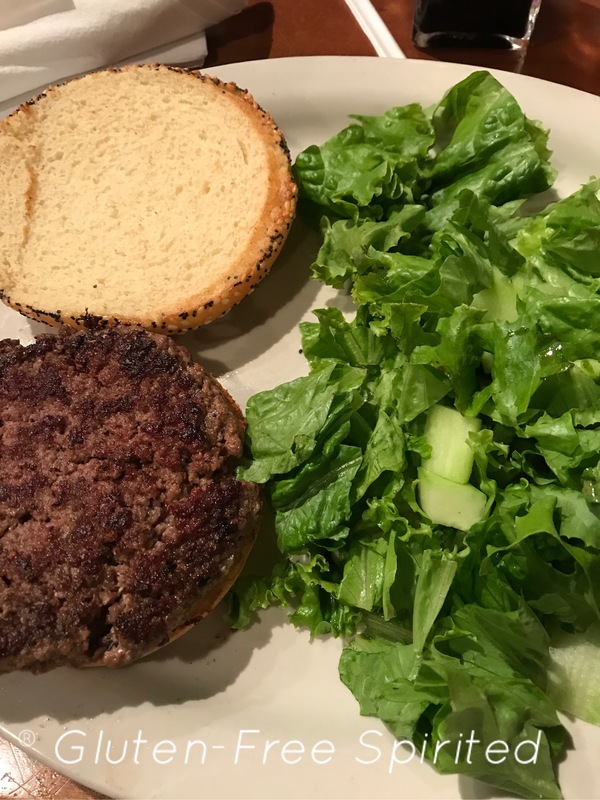 Most restaurants with gluten-free buns are gross, but she said this one was really good & she wishes all restaurants would offer that brand! There’s nothing liker a good ol’ burger! I love that we can mostly do every type of food and turn it gluten-free. I agree! And most of them taste just as good if not better than the original. Those sound like good choices! I hope that you do have a chance to go sometime! This looks so good. It’s nice to see gluten free menu in restuarants. 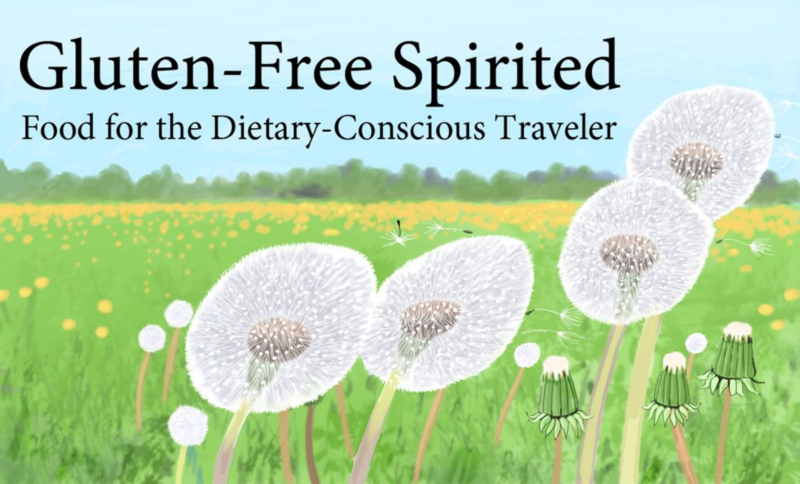 It’s been very helpful to have more and more restaurants have gluten-free options. Yummy this looks amazing. I have not had good gluten free bread. Good to know that there are Gluten-Free options. Travelers will really love this. They might be best friends because of the benefits this burger has for them. The place looks amazing, menu has loads of option. My choice would be something vegan. Normally fast joint have very limited choice forvegan and vegetarian. This actually looks yummy. 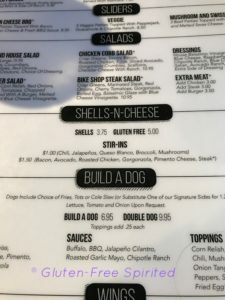 It’s nice to see gluten free menu in restuarants. I’m always appreciative of restaurants that cater to different dietary needs. More and more places should do so! This Burger looks so delicious. My husband will surely love this so i am going to do this for him. That’s a great idea! Hope he likes it! I’m usually not someone who visits a burger bar, but the quality of Kickstand looks good enough for me to try them! I won’t go for beef, so I’m glad there’s other alternatives! I’ve haven’t had a hamburger (or even beef) in many many years. But, sometimes when I get a good smell of a freshly made burger (especially homemade/handmade) my mouth starts to water. The food looks really good. Thanks for sharing. I’m sure you do get triggered even after not eating meat in so long. Luckily, they have some other options. Thanks for the feedback!